Are you sedentary? Sure you may workout regularly or play a sport, but I would still call you sedentary. According to physiotherapist and movement expert Gray Cook, unless you are on your feet 8+ hours a day, you are sedentary. As great as sports and exercise can be on your body, they are not enough if you spend the rest of your time sitting. Sitting is one of the worst things you can do to your health, performance or body composition and you need to make an effort to avoid it as much as possible. I am blessed to have a job that keeps me on my feet a lot of the time. I find that even a 10-12 hour day is not a problem if I can stand up and move around. However, when I have to sit for long periods of time, I feel like a beat-up old man. Why, because sitting wrecks you more than you realize. This places extra stress on your low back, creates misalignments in your lower body and leads to protruding abdominals (see more about this in my post on “The Real Secret to Flat Lower Abs"). When it comes to your performance, your glutes are your engine. Strong powerful glutes = strong, powerful athlete. 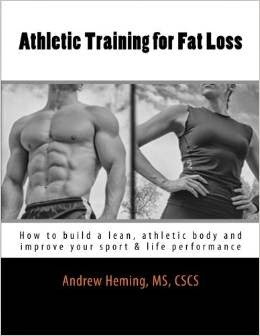 Weakened glutes mean the athlete is not running on all cylinders and tight hip flexors mean you are driving with the emergency brake on. As we slump in our chairs our heads jut forward and our necks hyperextend to so we can still see the TV or computer screen. This misaligns our bodies, impairs upper body performance and increases neck tension and headaches. The thoracic spine (or t-spine for short) is your upper back. Too much sitting will not only leave you looking like the hunch back of Notre Dame, but it creates huge problems for respiration and shoulder health. The hip joint is designed for weight barring. As physical therapist Gray Cook explains, when you sit all day, the lack of weight barring fails to drive the necessary nutrients into the joint. The result: poor hip health and a greater chance of a hip replacement later in life. 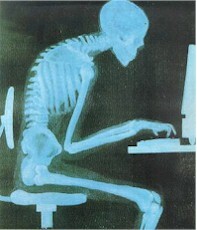 Most people are not aware that prolonged sitting is actually a risk factor for low back problems (Dr. Stuart McGill). Biomechanical research shows that sitting actually places more stress on the spine the many other daily life activities. Do you know why your legs feel so bad after sitting for a long period of time? Veins (which return blood to your heart) do not have the pumping action that arteries have. They require the contraction of your skeletal muscles help move blood along through them and back to your heart. 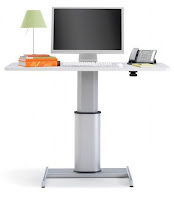 This does not happen very well if you are sitting and your muscles are not contracting. The lymph system also circulates better when you are up and moving around. Have you ever worked a manual labor job? If so, you probably found that the first week was really rough. However, your body adapts by increasing its work capacity and before long, it is not as bad. Sedentary athletes and trainees tend to have a lower work capacity. If this is you, the result is you cannot handle as much training and this hinders your results. I know this is obvious, but it needs to be said. How can you expect to be lean and muscular/toned if you are sitting around all day? If you work at a computer, create a stand-up work place. It can be as simple as propping things up on boxes or books as I have done. Buy a pedometer (one of those little step counters that clips on your belt throughout the day, but not during training. In addition to your structured sports/exercise program, try to take at least 10,000 steps per day. Hard-training athletes still need to rest. Too much additional physical activity can take away from their recovery. However, emphasize rest more with power naps and sleeping and less with sitting in a slumped position and watching TV or playing on your phone. Account for sitting in your training. Virtually every program I write includes hip flexor stretches, glute activation/strengthening and extra upper back strengthening exercises because almost everyone I work with (including athletes) spends their day sitting. And please, do not sit down when you exercise! Hi Andrew, Thank you very much for the great article. An eye opener for many. I have bookmarked the website and would love to read more articles. Thank for your kind words Mohammed. I hope you find the other information helpful for you. Thanks Adeyinka Adedeji, I appreciate your comment.